Mix 75gms RedLine Powder per 5 litres of hot water. Mix well and apply to carpet. 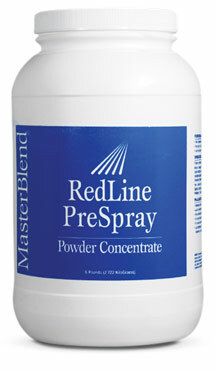 For use with an in-line sprayer mix 180gm with 5 litres (6 ounces with 5 quarts) water. For the best results agitate with a pile brush or rake. For upholstery and stain resistant carpets, mix 1 scoop per 4 litres of hot water. For olefin and heavily soiled carpets, mix 8 scoops RedLine PreSpray and 1 cup ZapIt with 5 litres of water in an in-line sprayer.